The word “rare” must trigger the release of chemicals in the collector’s brain which suspend rational thought. It’s only a record, for heaven’s sake, but..but..I must have it!! Possession of truly rare records comes at a price, in the case of jazz, somewhere between $3,000 and $8,000. What you have to bear in mind is that scarcity is not the same as quality. There may be reason why something is rare – it didn’t sell, because it wasn’t very good, but to the collector, scarcity has a value of its own. The word rare is also greatly misapplied in selling records. Records that are not at all rare are often described as such to boost auction prices. There is no objective test of “rare”, or at least not much of one, except for price and wily-collector know-how. 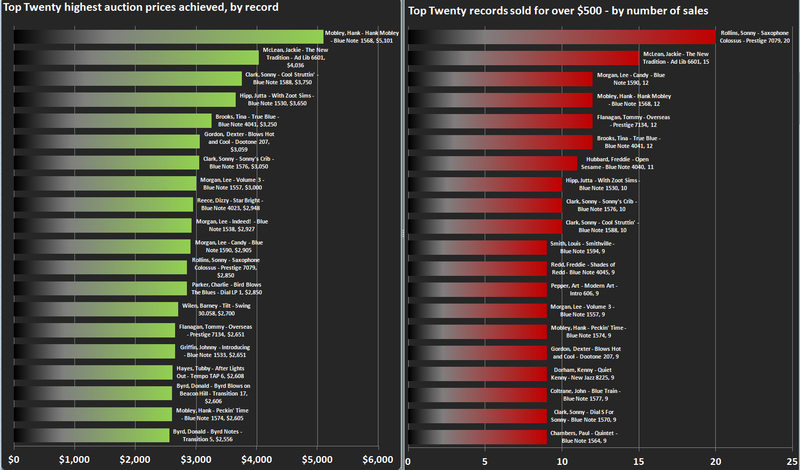 To bring some facts to bear on the subject, I have compiled some data from auction results, to identify the most expensive jazz records at auction, and how often they appear at auction, which are shown in the charts below. The most frequently mentioned are first pressings of early titles of Lee Morgan, Hank Mobley and Sonny Clark, which come in at the $5,000 mark. Many of these will be located in Japan, the biggest market in collectable jazz today. At this level the expectation is that the vinyl and sleeve are excellent to near-mint. Authenticity is paramount – all the details of first-pressing status must be present. Cover condition is highly important. As a listener, it is only the vinyl condition that matters to me, but for elite collectors it is the total artefact, especially the cover which must be perfect: no seam-splits, dinged corners, ringwear, or peeling laminate, and most important, no writing on the cover or labels – meaning no previous owners names, which includes unverifiable autographs. (Autograph-hunting was common practice in the 60’s , which encouraged many record owners to fake them and such records are often valued on the assumption that the “autograph” is fake). Be warned, these most desirable titles have been repressed and reissued over many years. It is very common for children or partners to inherit a loved-ones collection, search the Internet and become very excited that grandpa had a copy of say, Hank Mobley Blue Note 1568, which turns out on closer inspection to be a Japanese reissue from the 1980s. High-end records have always been rare and expensive and the province of high-end collectors. They rarely found their way into the collections of those with more modest means. In the era of the internet, prices can be established quickly with a little research on auction-tracking sites such as Popsike or for Blue Note, even here at Londonjazzcollector. Bear in mind that auction prices are the result of auctions, where collectors compete to buy a record, which is not necessarily the same as dealer or shop prices. There are many cases where, in a moment of madness, one bidder has got caught out with an inflated bid, and found themselves paying twice the next highest historical price, plus postage tracking insurance and customs charges. Ouch! Some records come up for auction much more frequently than their alleged scarcity would suggest, Mobley 1568 a case in point, which is a frequently traded item. High-end collectable records can be a good investment, though some artists have drifted out of fashion and proved a poor investment. “Oh I found a load of tins in the garage“, admits his good lady. “You dummy! Those are not eating baked beans, they are buying and selling baked beans. There are investors, traders, and dealers in high-end records, who understand the insatiable desire of a few souls who lust for something almost no-one else has got, something that people in their circle of acquaintances will recognise as insanely rare, writhing in envy. The high-end collectable jazz universe is very small, maybe only a couple of hundred people in a world population of three trillion. It is much smaller than the high-end rock pop classical reggae singles collector tribes. Outside of the jazz world, the truly rare and expensive records are associated with rock and pop history. For example, a test pressing of a Beatles recording that was never issued, only one copy exists, owned by Paul McCartney, valued near £1m. Another is the last autograph John Lennon gave on a record cover before being shot dead by Mark Chapman. But my favourite curio I read of was a record from the estate of Jimi Hendrix which Jimi had been playing when he cut his hand on a broken glass, leaving Hendrix blood in the grooves, verified by the DNA match. A different example of things that are “collectable”. What makes this ticket worth $5,000? What is a piece of “cultural history” worth? At least you can play a record. 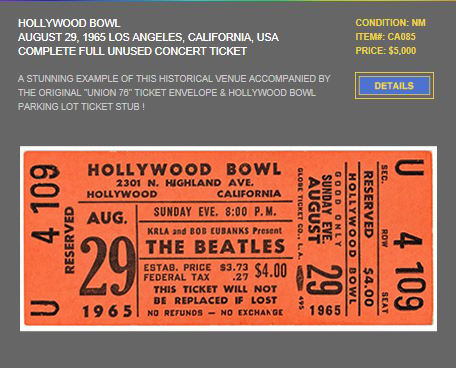 This ticket won’t get you a parking place at the Hollywood Bowl today, however they are not making 1965 again, and perhaps there is something to be said for owning a tiny piece of history. I have a large collection of records left by my husband dating back to the 1950s brubeck krupa Hampton lusher Herman Milligan miles Davis Ronnie Scott many original lables don’t know what to do with them don’t do eBay ?? Maggy. email address is in the blog banner under menu item “Contact LJC”. Self explanatory. I don’t want to repeat it here as bots routinely harvest e-mail addresses from anything posted on line to feed their spam-lists. Just post to the address given there, no problem. Can’t find any evidence of this, sure you have the title correct? What label, country, year, etc? I have a huge collection of jazz lps, most in pristine condition. The collection includes a 13-volume set, each volume contain multiple lps and each with a hard cover book with the history of jazz associated with those lps. (vintage 1930’s-1950’s). There are approximately 600 lps in the total collection. I’m In the process of inventorying the collection. Looking for info on a recording made in the 1930s or about. Song was Stompin at the Savoy (side 1 ) (side 2) Body and Soul. Musicians : Gene Kuppa, B. Goodman, and a few more. Story has it; this recording was made before any of the Players had bands. Recorded at 78 rpm on 12″ disc. Closest I came to sound is Gene Kuppa’s drum solo on internet search. 5000 series 10″ Blue Notes, don’t think I have ever seen an original, though our friends to the East reissued them all. I have a couple of Toshibas, two titles on one 12″. Not the same I know. Interested what they sound like. Must be 1955 or earler. If you like a copy let me know. I can do a CD or tape. No charge. Are these top 20 because of sentimentality or rarity? I feel like there are records way harder to find than these. “In his insightful book The Recording Angel: Music, Records and Culture from Aristotle to Zappa, Evan Eisenberg wrote about the unique motivations that lie behind the collecting of “cultural objects” such as records, noting five motifs as particularly significant. The first relates to time: “the need to make beauty and pleasure permanent,” based in a fear of its possible/likely disappearance, a motive common to cultural preservation efforts of all kinds. Third, he discussed the “need to distinguish oneself as a consumer,” to become “heroic consumers” who “spend on a heroic scale, perhaps, or with heroic discrimination,” acquiring the rarest items or the most complete set, or going to the greatest lengths for a purchase. The fourth motive has to do with nostalgia, a sense of belonging felt through collecting bits of the past; the collection itself serves as a bridge, and “each object connects its owner with two eras, that of its creation and that of its acquisition. I have a theory that rare jazz records are perfect objects for money laundering. I think the vintage jazz record market is a bit small to offer a useful way of laundering ill gotten gains. I am sure of your best intentions, but no solicitation/offers of sale of records permitted in comments on this site, sorry.